Vegetarians needn't feel left out. They can enjoy the flavour of the barbecue, too, as long as their dish is not cooked on the same meaty rack. If your barbecue is not large enough to allow for a clearly delineated vegetarian area, cook the courgettes and aubergine on a couple of disposable barbecues. The sweet and sour chickpeas can be made a day ahead and covered, then chilled until needed - reheat gently in a saucepan. I prefer to salt the aubergines and courgettes as it helps concentrate the flavour and they need less oil for cooking - if you're short of time, skip this stage. Lay the courgette and aubergine pieces on a tray and salt lightly. Leave both for half an hour, then rinse and dry on kitchen paper. Toss with the olive oil, lemon juice and seasoning. Meanwhile, make the sweet and sour chickpeas. Heat the olive oil and fry the garlic until golden brown, then add the tomatoes, sugar, vinegar and seasoning. Simmer for about 10 minutes, or until very thick. Add the chickpeas and simmer for a few more minutes. Remove from the heat and simply reheat them when needed - on the barbecue if possible, or ask someone to nip back into the kitchen to heat them on top of the stove. 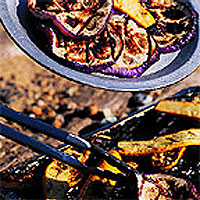 Barbecue the courgette and aubergine pieces for 4-5 minutes each side, or until they are tender and mottled brown. Arrange heaps of the courgettes and aubergines on plates, spoon over the sweet and sour chickpeas, then scatter with the feta cheese and shredded basil. Garnish each plateful with whole basil leaves, and serve.